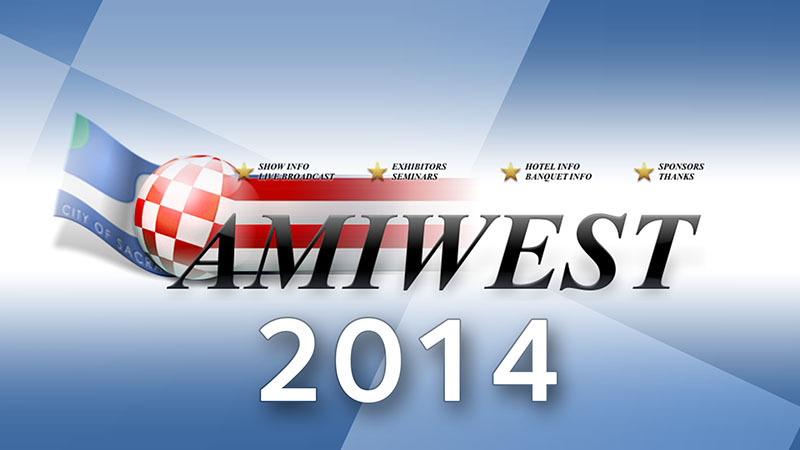 I can't believe we are only a couple of weeks away from another Amiwest show. It seems like only yesterday I was packing my red suitcase for my now annual pilgrimage to Sacramento. A lot has happened in the past year both in the Amiga world and my personal life. My youngest daughter got married and I finally received my New Zealand permanent resident's visa, oh and we developed the AmigaONE X5000 ;-). As usual A-EON will use the Amiwest show to announce a lot of cool new projects with continued focus on adding new content and capability. From recent speculation it seems that everyone is keen to find out what A-EON has in the works but you will have to wait for Amiwest for a full update about projects that are coming to fruition. 😉 One development that is not a secret is the new AMIstore for Amiga developers and enthusiast which will be launched officially launched after Amiwest. A long time ago in a galaxy far, far away (apologies to all Star Wars fans). 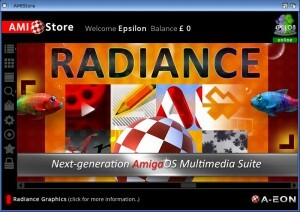 Actually way back in early 2005, I was a recent and late convert to the next-generation Amiga scene. As a long-time Amiga enthusiast I didn't acquire my first "next-generation Amiga" until 2004. It was a Micro A1-c supplied with a pre-release version of AmigaOS 4. I was totally amazed what this little machine could do but, coming from a Classic Amiga background where I used a range of big-box Amigas for video, DTP and graphics work, I quickly discovered that the new breed of Amiga One machines were sorely lacking in quality software applications. 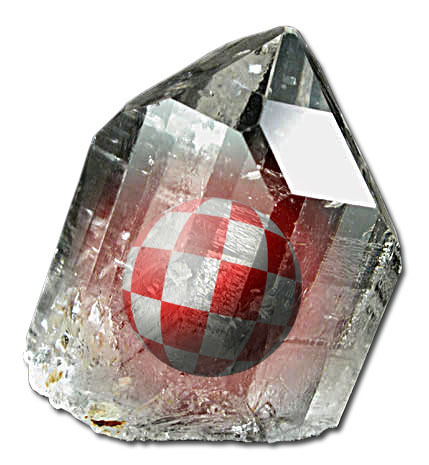 In early 2005 I tried to drum up support on AmigaWorld.net for a special software development fund to encourage talented developers to create much needed software for the AmigaOS. Unfortunately, it did not create a lot of traction at the time. Instead, I decided to create and fund a Developer hardware donation programme and began buying and donating "next-generation Amiga" hardware to Amiga developers all over the world. Eventually I became one of the founding moderators of AmigaBounty.net and, although I think it served an important role, I still felt there was a need to help talented developers benefit from their work and encourage more quality AmigaOS software development. In 2009 I discussed outline plans with Matthew Leaman of AmigaKit for a special "website" which could provide a "shopfront" where developers could offer and sell their software. 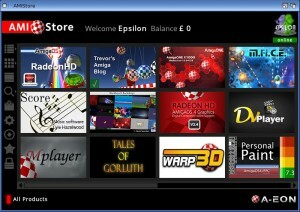 Incidentally, Epsilon's AmigaONE X1000 blog is probably one of the best AmigaOS 4 related blogs on the internet and always well worth a read. OK it's probably one of the worst puns ever but I'm pleased to report that AmigaKit is in possession of all of the Cyrus+ revision 2.1 motherboard destined for the beta test team. Over the past couple of months boards have began trickling out to developers and experienced beta testers. 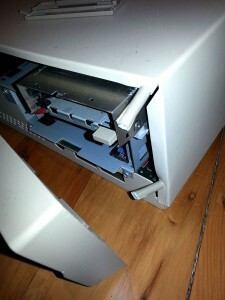 Meanwhile, based on our specifications to provide the user with a much more "Amiga-like" early start-up experience, Ultra Varisys have been customizing the Cyrus+ UBOOT firmware. It's all coming along very nicely. Meanwhile our core Linux team have also been very busy and we already have a working Linux distribution up and running on the Cyrus+ motherboard, complete with 3D hardware accelerations for a range of RadeonHD graphics cards. Darren Stevens created a video of Linux and AmigaOS 4 booting on his Cyrus+ board. 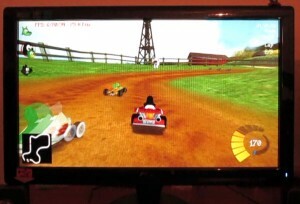 He used the ubiquitous Supertuxkart racing game as a test of the machines 3D capabilities under Linux after which he shutdown Linux and booted a debug version AmigaOS4.1 off a USB pen drive. Now that's just showing off. 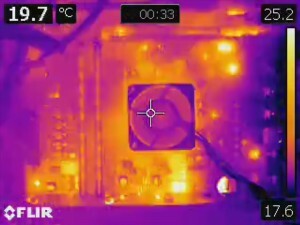 Fellow beta tester Alex Perez, used a FLIR thermal infrared camera to photograph the thermal characteristics of his Cyrus+ board under power. The result was a pop-art psychedelic image which shows our Cyrus+ board is one cool dude! Party on Man! 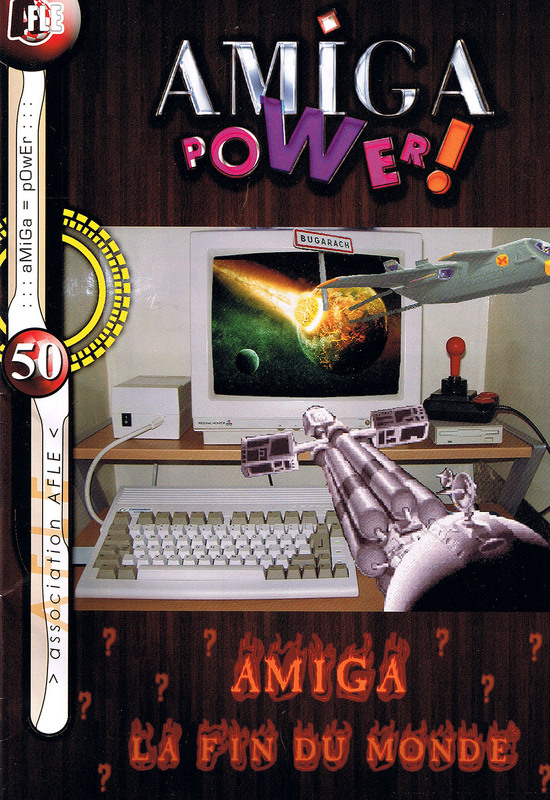 It still amazes me that 20 years after the death of Commodore there still a number of Amiga printed magazines available to purchase. OK they are not mainstream and are usually created by a local Amiga user groups but the quality and content is in no way diminished. 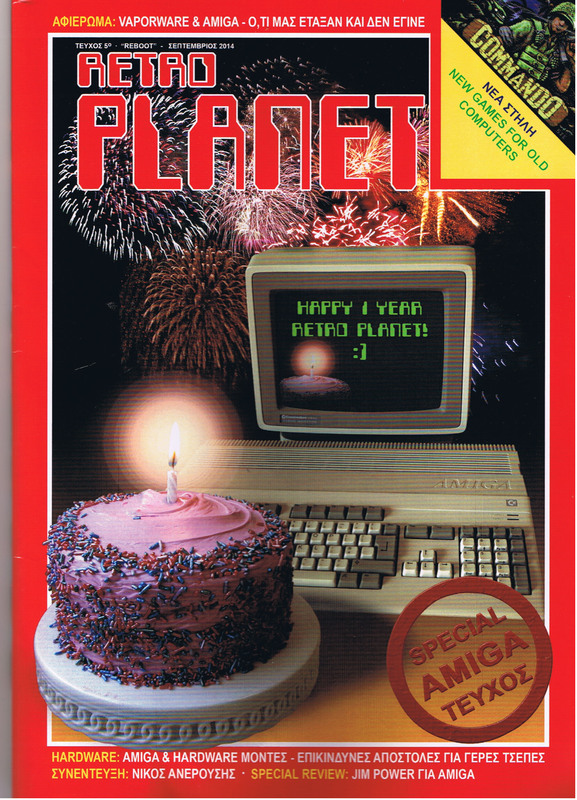 Meanwhile, at the other end of the spectrum, Retro Planet, the Greek language Retro magazine which is a relative new comer to the scene, is celebrating it first Anniversary. Retro Planet, is a glossy magazine created by Amiga Planet which covers all retro computers but has a heavy bias towards the Amiga and next-generation Amiga-inspired systems. 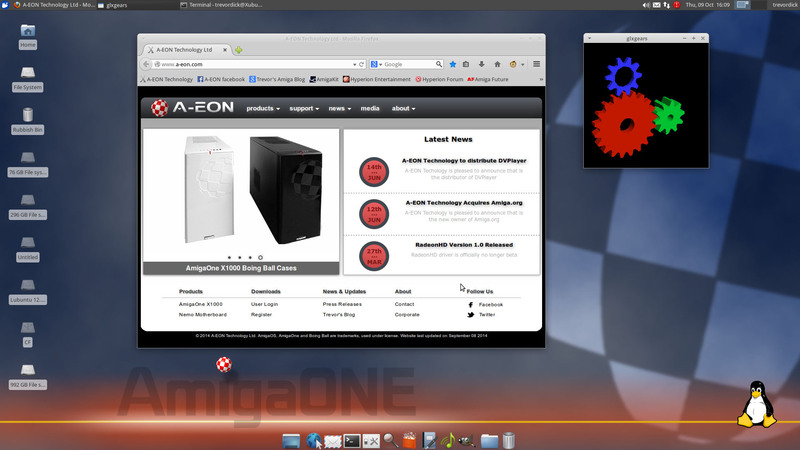 Our core Linux support team have also been very busy supporting the AmigaONE X1000. 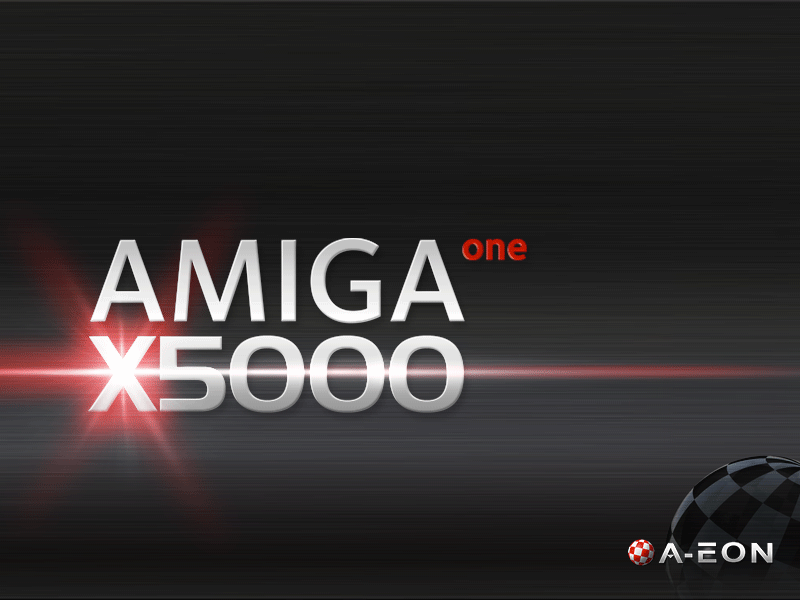 One man dynamo Christian Zigotzky has continued to update the AmigaONE X1000 Linux kernel while increasing number of Linux distros that the AmigaONE X1000 can support. Just as Linus Torvalds has announced the latest stable release of version 3.17 of the Linux kernel, Christian has been diligently keeping the AmigaONE X1000 kernel bang up to date. He has also created a long term version of the 3.13.15 kernel for the X1000 which is based on the 3.13.0-36.63 kernel developed by the Canonical Kernel Team. This will be used by Pat wall is working on an updated Ubuntu Live Remix iso which is based on the 12.04.5 LTS (long term support) distribution. Not only does it include the long term kernel it comes with version 32.0.3 of Firefox and several new Desktop images created by Kevin Saunders and of course the latest version of SuperTuxKart 0.8.1. 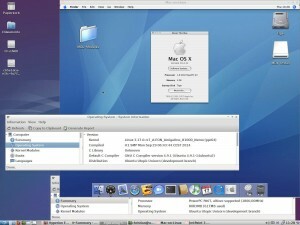 Pat is also working on Xubuntu flavour based on Xubuntu 12.04.5 LTS. I occasionally I see comments that no self respecting "Amiga" should run anything other than the AmigaOS. While I can understand that opinion, after all none of us would still be Amigans if we did not continue to support the AmigaOS or the other AmigaOS-inspired operating systems. However, let's not forget that the original Amiga also supports several non-native operation systems. The Amiga 2500 & A3000 both supported Amix, an early versions of Unix released by Commodore and who can forget the Emplant board and Mac OS emulators which turned the Amiga into a faster machine that Mac it was emulating, much to Apple's annoyance at the time. Talking of MacOS, Christian has now managed to get MOL (Mac On Linux) up and running on the AmigaONE X1000 so there is another OS to add the growing list that the AmigaONE X1000 supports. Christian reports that MOL on the X1000 requires the latest 3.17 kernel (RC1 or above) and it supports both Tiger and Panther MacOS X PPC versions. It's good to see history (sort of) repeating itself and I'm pleased that X1000 owners are able to benefit from all the OSs and software that is available to them. 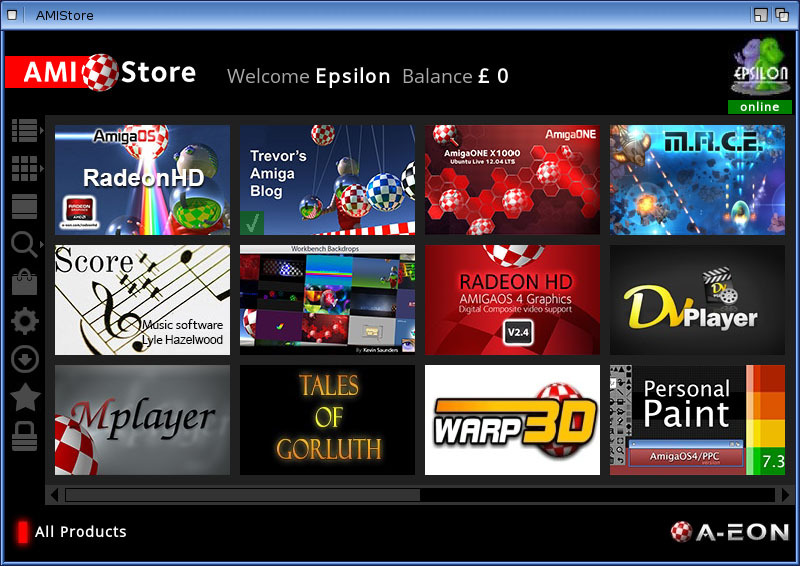 Having said that I am keen to increase and improve the content for all AmigaOS and AmigaOS-inspired flavours. As some of you may know I am an avid Commodore and Amiga collector, although these days I don't have a lot of time (or space) to add to my collection. Every now and again I'm tempted to add a small item to my collection especially if it's something a little special or unique. Having written an article about GVP for my Classic Refection series in Amiga Future magazine I jumped at the chance to acquire a GVP A3001 Upgrade kit that was still in its original shrink-wrapped packaging together with a pristine A2000. Unfortunately, due to inadequate packaging and the heavy handedness of international couriers the previously pristine A2000 arrived damaged! The front fascia had snapped off, the FDD cover was broken and the metal case was dented and badly distorted. Surprisingly the A2000 board itself was undamaged. 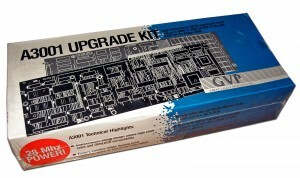 Fortunately, the GVP A3001, which was well protected by it's original packaging, was completely undamaged. 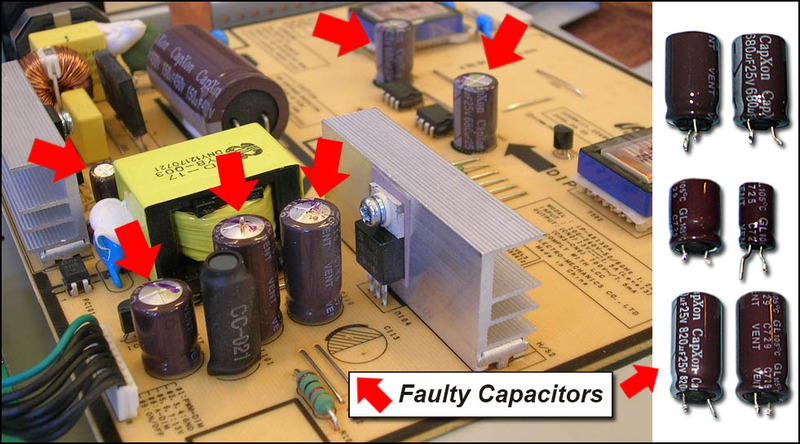 Rant mode on: It is a real shame that an Amiga 2000 that was almost 25 years old and in obvious excellent condition should be damaged through a combination of poor packaging and heavy handed couriers. 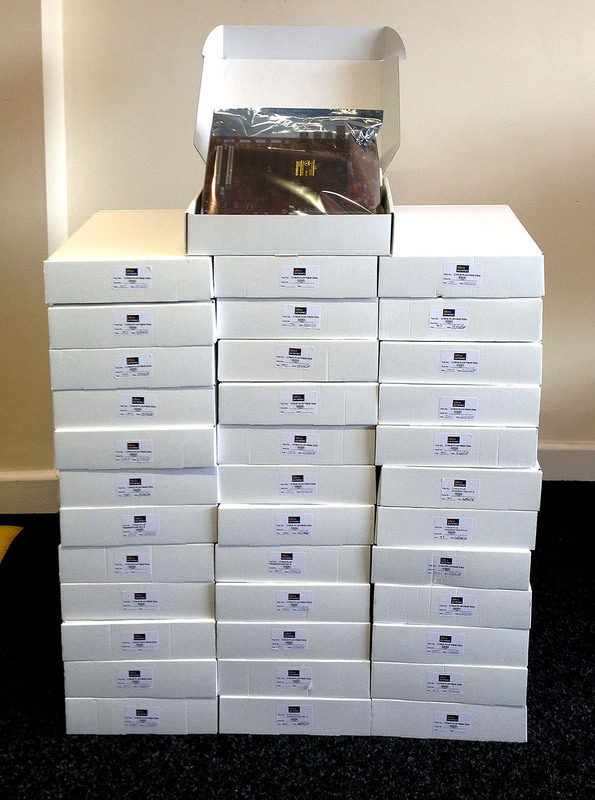 If you are thinking of selling your Amiga hardware make sure it properly packed and protected for shipping. Rant mode off! Talking about Classic Reflections, look out for issue 111 of Amiga Future magazine for episode 18 of "Classic Reflections" and find out "What really happened to Village Tronic Marketing GmbH?" If you enjoy the Classic Reflections series and would like me to write about one of your favourite Amiga hardware or software suppliers who had a major impact on the Classic Amiga scene please send me an email to contact (at) a-eon.com with your suggestions. One of my computer monitors began playing up several months ago. It was a flat-screen 22" Samsung SyncMaster 226BW with a native display of 1680 x 1050. 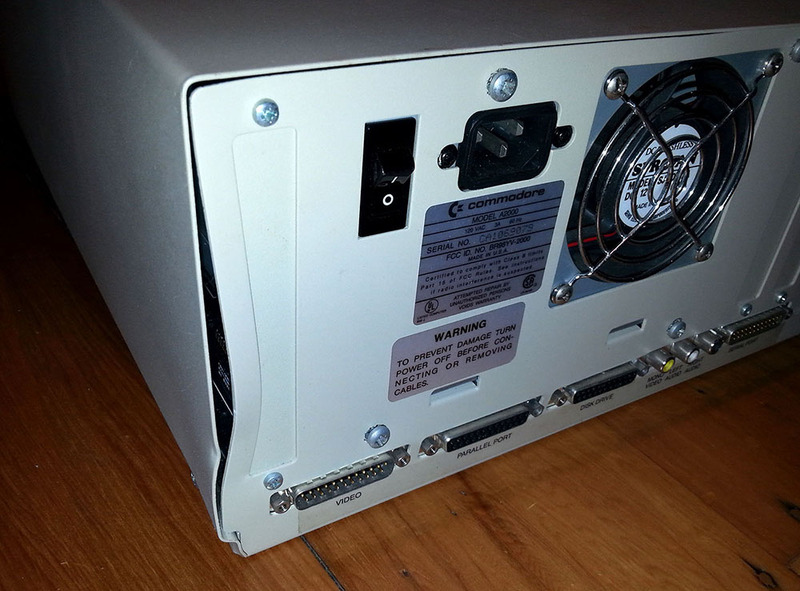 It was not my main workstation but I liked to use it because it included both DVI and RGB ports which enabled me to connect both a Windows PC and the second Radeon graphics card installed in my AMIGAone X1000. On first power up the display would flicker ON/OFF continuously for a period of time before finally displaying the Workbench screen. The period of flickering got longer and longer every time I switched on the monitor until eventually it failed altogether. 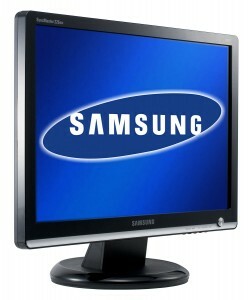 Prior to this problem the monitor had been a very reliable and I was reluctant to just consign it to the rubbish bin. 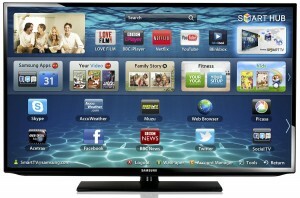 I am am Amigan after all and I'm loathed to part with any hardware. 😉 I trawled the web for possible repair solutions and was surprised to find that my monitor's failure mode was a very common problem shared by many of the flat-screen models in the Samsung monitor range. C64 enthusiast, Rocco Di Leo (aka actraiser), recently sent me a link to his dustlayer.com blog. Apparently a good friend of his start ed a new company in Hong Kong and moved into premises alongside offices which housed the former Commodore and Amiga production line. His friend got his hands on a CD with some old photos from December 1992 which were taken by Robert Baker who was in production engineering at Commodore in West Chester, PA. Baker was one of two Commodore test engineering employees sent to Commodore's Hong Kong manufacturing plant in December of 1992 for the pilot production run of the Amiga 600 computer system. The photos show images of the surface mount line, various assembly lines and test equipment as well as the manufacturing engineering office and lab areas. 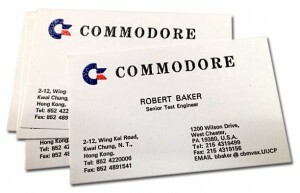 Rocco obtained permission from Baker to post the photos and even obtained some of Baker's old Commodore business cards.